I recently wrapped up a job of 13 years, so have had less time to focus on the collection and blogging of late. Hope today's hard-to-find type card from Canada is worth the wait! 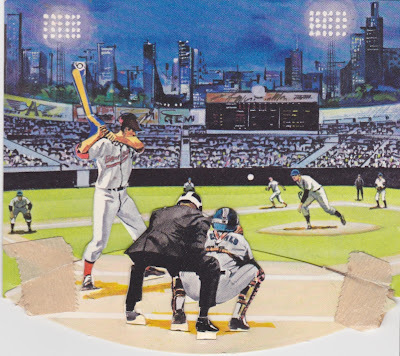 This 4"x4" pose of an unknown hitter poised to swing started as a larger punch-out card packaged in Canadian cereal boxes. 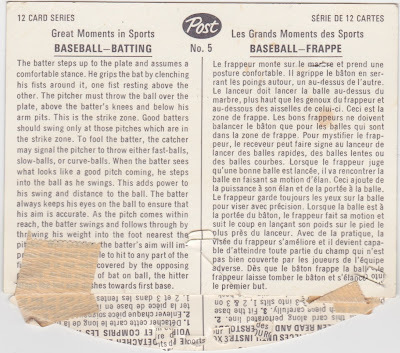 Kids then separated the background, batter, and umpire/catcher into pieces with numbered tabs and matching slots. Combine everything correctly--via instructions in English or French--and you have a tiny diorama, similar to one scene from a pop-up book. 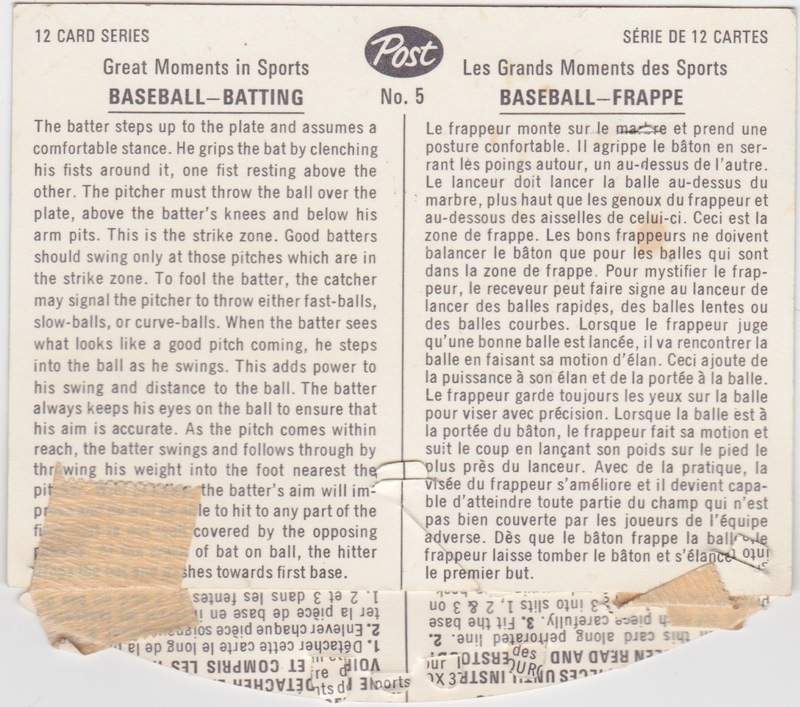 The bilingual back gives a functional account of the batter's task, to evaluate and swing at incoming pitches. I assume it's just as dry in French. Note the small triangular cut near the bottom middle--that's a fold-out support panel that helps it stand upright when assembled, like a leg on a picture frame. This card's previous owner taped its corners to avoid losing this base, making it difficult to stand up as Post intended. To my knowledge, this set's uncatalogued by the typical baseball collector guides, so it's not easy to discover why Post produced this unusual set design. 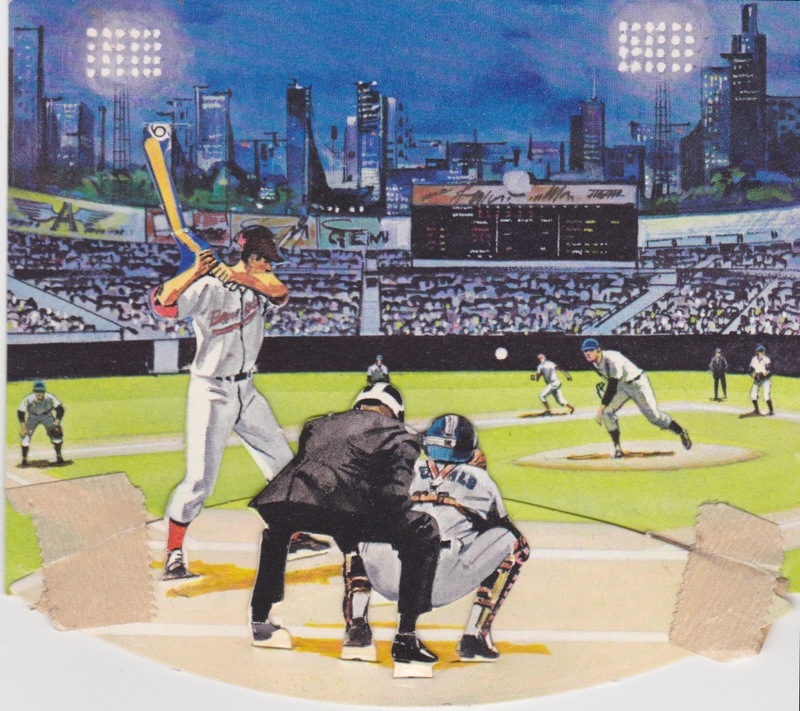 12 panels comprise the whole set and baseball appears just once. Good thing for me it was #5! 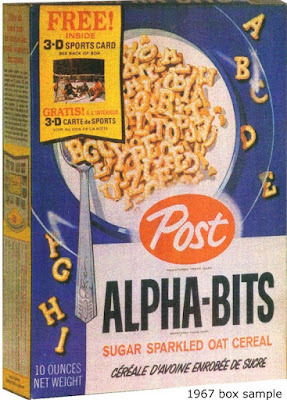 UPDATE: See the Post Cereal Baseball Card Museum profile of this set, complete with original box and advertising. Value: I paid $25 on eBay for this #5. They're so rare I'm not sure if that's fair or not, but Roger Bannister's fame should make its track card most valuable to collectors at large. Fakes / reprints: It'd be tough to fake all that die-cutting and not worth doing for a card with no real players. That is quite the oddball. But better than a decoder ring. This set reminds me of the 1970-80s Sportscaster set in size and purpose. I wonder how kids reacted to the basic sports info--excited to have them? Wondering who the players were?